This post is a part of AIRTHplorers series written by passionate people out there, working on their products, projects, and innovations. We have invited them to share their pick of trends and novelties that might be a passion-match for you too! I am Darija Cvikl, Ph.D. student at UP FTS Turistica. My research field is related to forest tourism, it’s potential, innovation capabilities and main shortcomings, preventing the development of Forest Tourism System. The attractiveness of the forest as a tourist destination and it’s potential for tourist purposes has been underestimated so far. My aim is to encourage and promote forest tourism in order to provide the innovative integration by interdisciplinary approach of the development concepts of non-wood forest products and socio-cultural values. To present forest tourism development and problems with legalizing such activities in protected zone Delibatska pešćara (Serbia), I conducted an interview on 14 May 2018 with Slavica Miletić Brkić, univ.dipl.arh., owner of tourist accommodation and provider of tourist forest activities in the area of Delibatska peščara. The whole of her family is involved in the forest tourism activity and here are the main topics we have covered in our exciting debate. The history of Delibatska peščara and its qualities provide an integration of the elements and nature. Peščara, which is celebrating 200 years of reforestation and existence, is the so-called European Sahara and it has an Aeolian, scientific and forest role. It represents an interesting example of tourism happening in a protected area. In Delibatska peščara there are 1100 species of insects, 800 species of flora, 650 species of medicinal plants (source: Encyclopaedia by dr. Jovan Tucakov), 10 species of game animals, 800 species of birds, ten indigenous species of plants and animals, 6 types of sand with the finest granulation in the entire Pannonian Plain, 4 types of biotopes – forest, desert, steppes and swamp. More than 760 scientific works have been published about Delibatska peščara. forest tourism development in the light of the rural tourism offer of a country. development of forest tourism and forest therapy in Europe and globally. Their usual customers are business people, families with children, groups of young people, professional associations and people with health problems. Slavica and her team offers theses customers anti-stress therapy, presentation of local traditions and customs, parties in a forest (e.g. forest family patron's day parties), biologist expeditions, bird-watching, ORKA – seminars of the Association for the protection of animals, and NURDOR – donation accommodation for parents whose children are treated for cancer. Purchase or construction of an accommodation facility in the protected region. The first forest house was bought in 2005 in Deliblatska peščara in the Municipality of Bela Crkva. 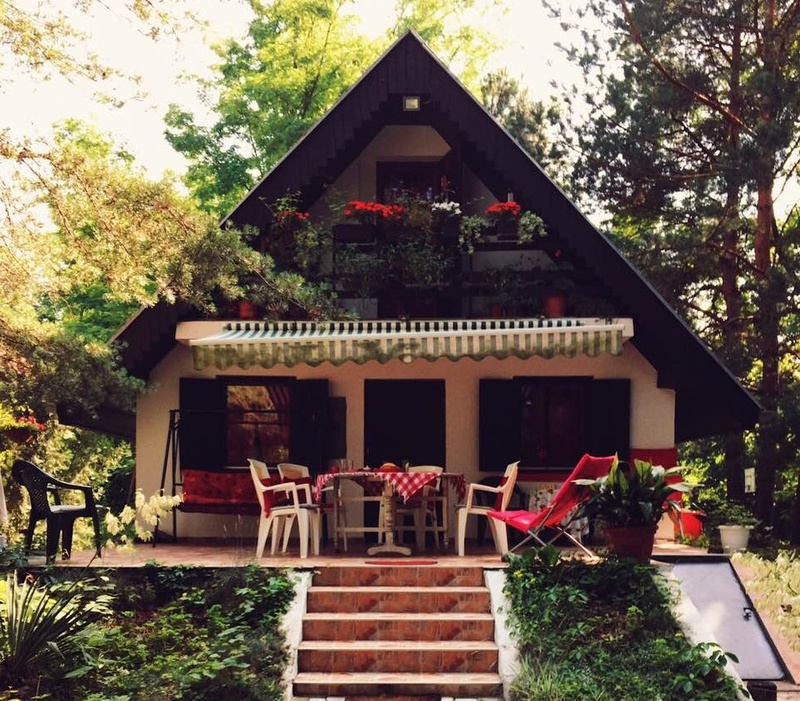 It is located on the edge of the Peščara in an area of weekend houses, built in the 1970s, which is now in the zone of protected Deliblatska peščara. The second house Spomenak was bought in 2006. The legalization of residential buildings for tourist purposes. The first house was legalized after three years of efforts and work on the legalization and regulations because it was not legal according to the law. All houses are legalized as "small accommodation facilities for small groups of 6 to 8 tourists". After the legalization, the houses were subject to categorization. Slowing down the processes of legalization and categorization for the realization of tourist offer. The first problem was the size of the houses as they were bigger than allowed by the law. The second problem was a lack of understanding by competent institutions. The interested entrepreneur has to find their way through tourist and sanitary inspectors. She has to conduct the expert macroanalysis (up to 30 km), mezzoanalysis (up to 5 km) and microanalysis of the plots herself. Slavica comments this as follows: "The categorization of the first house took three years. The first forest house was categorized in 2008 by Categorisation Board of the Municipality of Bela Crkva. However, none of the tourist organizations – neither Tourist Organisation of the Municipality of Kovin (where we live) nor Tourist Organisation of the Municipality of Bela Crkva (where we are located) wanted to cooperate or participate in the presentation of the accommodation and tourist forest service. I have tried to involve Tourist Agency Magelan - Novi Sad and tourist agencies in Belgrade to cooperate, but they were not interested. At the Tourist fair in Belgrade, one of the tourist employees said: "You know, your (small; authors note) size reflects the amount of our interest in you"... It was only in 2018 that the entrepreneur managed to initiate cooperation between Tourist Organisation Kovin and Tourist Organisation Bela Crkva. The cooperation started after successful workshops in 2017 and interview with the representatives of the Economic Interest Grouping. Adoption of the workshop guidelines increased the number of visitors by 45% in one year. Local municipalities are not connected. Deliblatska peščara spreads into five municipalities. However, there is no cooperation or connection between them, which creates an additional issue for the entrepreneur. A part of Peščara is managed by ŠIK Banat which is a part of public forest industry corporation Vojvodina šume. It took six months to make an appointment with the Director of ŠIK and conclude a cooperation agreement under which our guests could walk in the reserve. The agreement has been concluded, but it is not implemented as the prices set by ŠIK were abnormally high, and no guests would pay them. Individual surpassing of regulatory limitations. After five years of fighting with the lack of understanding by the environment and local institutions, the entrepreneur realized that she has to fight herself for the regularity of her operations in the field of providing forest tourist activity. In 2010 she registered her private undertaking also as accommodation for short stays and thus entered the tourist activity and legalized her activity in full. In the local business register agency, she was told: "You are the first to do this" … and finally she was allocated the official working address. 2010 - 2017 they work themselves without any help from the outside. They had visitors from 21 foreign countries and Serbia. After nine years of work, the local tourist association recognized her work. In 2017 Tourist Organisation Bela Crkva invited her to the tourist fair which she attended as a provider of private accommodation. Invitation to the second fair came from a tourist agency from Novi Sad - they went to Fair of Healthy and Active Life in Belgrade 2017. That's how Slavica's first presentations to the general public happened in a tourism bulletin, at a lecture on forest therapy and antistress therapy at the fair, and via presentation at a fair stand. In 2017 Slavica got the invitation from Economic Interest Group to participate in workshops, related to specificity in tourism within tourist cluster in Vojvodina and participation within the Banat cluster. In autumn 2017 they helped her with the presentation of Deliblatska peščara as a tourism destination, and a trip to Istria and Slovenia as a prize was awarded to Slavica by Economic Interest Grouping. In summer 2017 Slavica and her team expanded the accommodation capacity and bought and categorized Forest house ***. Slavica's energy is focused on the future as well. She plans an investments in infrastructure and forest tourism offer: a sand court (volleyball, badminton, frisbee), fixed table-tennis table, concrete circle seating area with a fireplace, purchasing equipment for Nordic skiing, bicycles, kayaks, canoes. We wish her all the forest luck she needs!